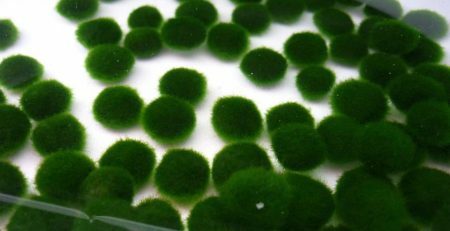 Marimo Moss Balls, also known as Moss Balls, Algae Balls, Lake Ball, Marimo Moss Ball, Japanese Moss Ball, Cladophora sauteri, or Cladophora aegagropila, are exotic and beautiful. They can make a beautiful addition to your aquarium or decorative pond. Dr. Anton E. Sauter, a botanist from Austria, first discovered Marimo in 1823. His find was located in Lake Zeller, Austria. Hokkaidō: Japan’s northernmost island, is home to some of the country’s most unique national treasures. It is the heartland of Japan’s indigenous Ainu people (who are showcased in Miyazaki’s 1997 animated film Princess Mononoke), as well as some of Japan’s oldest and most beautiful national parks. And, if you were to dive in the lakes of Akan National Park, you would encounter one of the rarest aquatic algae in the world: ‘mari-mo’ (毬藻), which in Japanese means: “bouncy ball of seaweed”, or more eloquently put: “seaweed ball”. 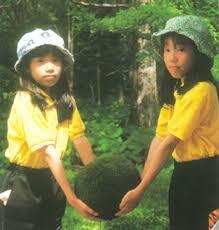 These spherical algae were also found in Lake Akan in Hokkaido, Japan. The Lake Akan’s Marimo is defined as a Natural Treasure of the country because of its beautiful velvet and spherical shape. 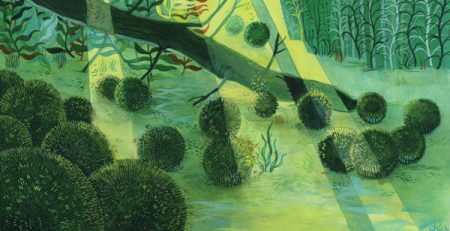 There are three variations of the Marimo Moss Ball: Spherical shape (aggregated Marimo filaments); free-floating filaments as small tufts of unattached filaments that frequently form a carpet on the muddy lake bottom; and epilithic (growing on rocks). Marimos are found in some of the lakes in Japan and other countries, but the beautiful spherical shaped Marimos are only known in Iceland, Estonia, and Japan. There are natural Marimos as well as man-made Marimos. A cross-section view of each can be found below. Fisherman in Iceland called it Kulvokitur, Muck Ball. The villagers of Hokkaido named him Torasampe, the Lake Goblin. Its scientific name Aegagropila Linnaei is Greek for Goat Hair. 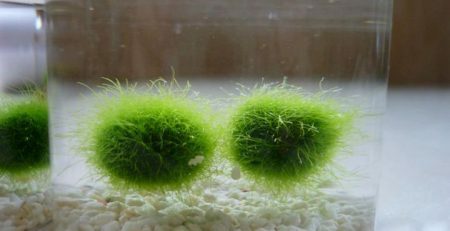 Marimo Moss balls, literally ball seaweed, as known today is a rare species of spherical green filament algae, found in certain lakes in the northern hemisphere. Native to Japan and esteemed as a national treasure, Marimo Moss Balls grow in patches on lake floors at depths of 6 ½ to 8 feet (2 to 2.5 meters). They are constantly sculpted into their endearing, spherical, velvety shape by the gentle effleurage of the waves that stir, shape, and flush them. 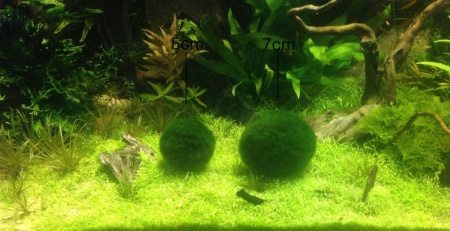 Marimo Moss balls in their natural habitat grow about .2 inches (5mm) per year and can reach up to the size of 8 to 12 inches (20 – 30 cm). 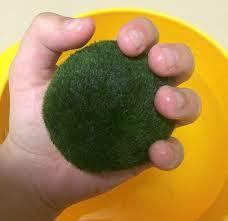 Domesticated Marimo Moss Balls appreciate room temperature water changed every one to two weeks. If the temperature in the room exceeds 80* Fahrenheit (25* Celsius), remove them from that location and place them in a cooler location, such as a refrigerator. It is to be noted that they do not survive freezing. 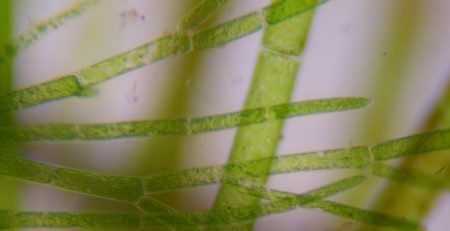 As Marimo Moss Balls are from the Kingdom of Plantae, Division Chlorophyta, they appreciate light. Standard household lighting will suffice, or indirect sunlight. Turn them over occasionally, with gentility, to help them maintain their adorable, bulbous shape. Though it rarely happens, if after time one breaks apart, you can now welcome a new brood into your collection. If the Marimo Moss ball turns gray, gently turn it over to ensure that the gray area gets light, or you may add a minimal amount of salt as a remedy.